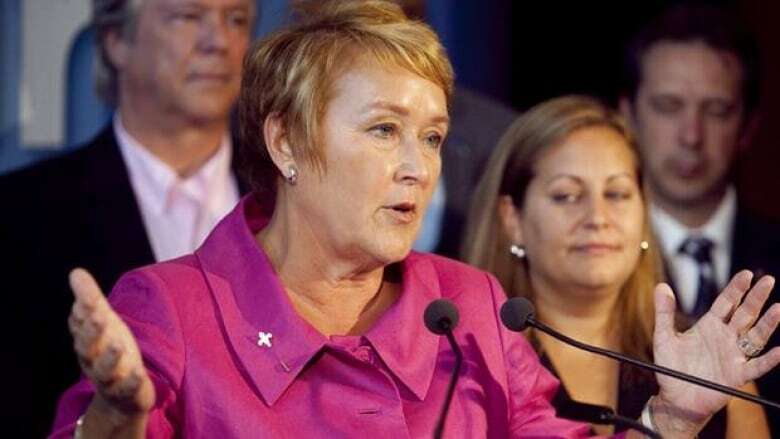 "In the case of anglophones, be it a native or a new arrival, listen, the common language here is French," Marois said. "Is there anyone who can imagine not knowing it?" Marois has said during the campaign for the Sept. 4 election that she would toughen Quebec's language laws if the PQ takes power, and introduce a Quebec citizenship. The latest language proposal could potentially have its greatest impact in aboriginal communities. Kitty Gordon, a spokeswoman for Makivik Corp., which oversees resource development of Quebec's north, expressed outrage at the PQ plan. "I think it's kind of ridiculous for anglophones and aboriginals," she said in a telephone interview. "Are they saying that the Quebecers were here first so that's why we have to speak French? It's like saying the Inuit were here first so you all have to speak Inuktitut." She says few community leaders currently speak French, although there are an increasing number of young people who do so. "The older generation, the leaders of today, only speak English and Inuktitut but the younger generation like myself, I speak French, I went to school in French up north in Nunavik starting from kindergarten," Gordon said. "But the students today, whether you're French, white or any other race, if you go to school in Nunavik, you must go to school in Inuktitut for the first three years and then you choose whether to go in English or French." She says language has never been a barrier to negotiations in the resource-rich area — which is the hub of increasing mining activity in the province and the home of the Charest government's Plan Nord. "No, not really," Gordon said. "If so, we have French-speaking senior employees as well who are able to translate but there's never really been an issue like a language barrier between our leaders today and the Quebec government because they all speak English too." The language proficiency idea has its roots in a 2007 project by the PQ which seeks to establish a Quebec constitution and Quebec citizenship. The idea drew outrage when it was originally raised in 2007 from such groups as the Centre for Research-action on Race Relations and B'nai Brith Canada, which described it as xenophobic and similar to proposals by extreme right-wing parties in Europe. One newspaper columnist said the PQ idea is probably part of its broader plan to achieve independence. The party has said it will pick fights with the rest of the country, and use each one to argue its case that Quebec's culture can't survive within Canada. "This one will go straight to the Supreme Court (and that's probably the goal)," Montreal La Presse political columnist Vincent Marissal wrote on Twitter.